The decomposition of GaN is presented up to P=9 GPa. The new indirect method of obtaining melting temperature from decomposition data is given. All existing models and theoretical predictions for GaN melting are discussed. The new way of portraying melting temperature under pressure is discussed. The latter is both for dTm/dP>0 and dTm/dP<0. Gallium nitride (GaN) is considered to be one of the most important semiconductors nowadays. In this report a solution of the long standing puzzle regarding GaN decomposition and melting under high pressure and high temperature is presented. This includes the discussion of results obtained so far. The possibility of a consistent parameterisation of pressure (P) evolution of the melting temperature (Tm) in basic semiconductors (GaN, germanium, silicon…), independently from signs of dTm/dP is also presented. 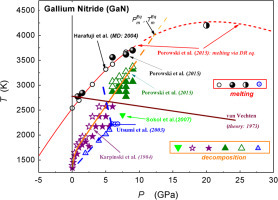 The compilation of experimental data and theoretical predictions for gallium nitride (GaN) decomposition and melting in the pressure–temperature plane (P–T). Theoretical predictions are related to van Vechten model (1973) and Harafuji et al. (2004) molecular dynamics (MD) simulation. The rest of data is associated with experiments, recalled in the Figure. Results of the given report are indicated as ‘Porowski et al. (2015)’. The portrayal of the hypothetical melting curve has been carried out via the equation and the derivative-based procedure proposed by Drozd–Rzoska et al. (2005, 2007). The same way of analysis was applied for describing the pressure evolution of the melting temperature in germanium and silicon.